Quilt historian Lisa Evans, whose specialty is medieval and pre-Colonial quilting, points out this remarkable patchwork textile which was found covered with mud at the bottom of a castle well in Budapest, Hungary. 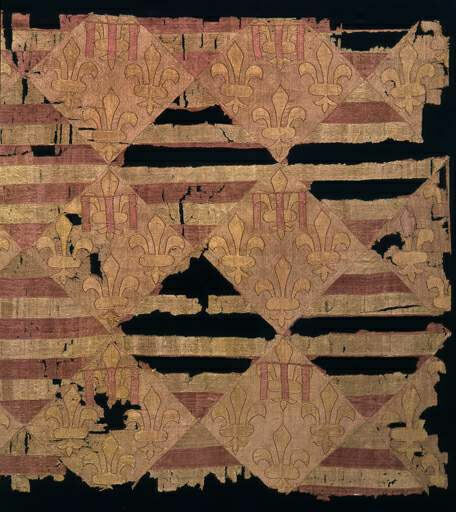 The silk textile is worked in both patchwork and applique, and features on-point blocks about a foot square, alternating setting squares pieced of red and white with appliqued blocks with the (Hungarian) Arpád and (Neapolitan) Angevin heraldic devices (referring to King Charles Robert, whose father was king of Naples and Duke of Anjou, France). The Budapest Museum notes that a similar textile covers the back of King Charles Robert's throne. The Angevin blocks on this quilt may be familiar to you from the chief of Anjou found on many Italian coats of arms. There's an article this morning from the Carmarthen Journal about one of the participants in the Thames Diamond Jubilee Pageant for the Queen this coming weekend. The individual being highlighted is Thomas Lloyd, Wales Herald Extraordinary, who will participate with the other members of the College of Arms (and others, including the Chief Herald of Canada, Claire Boudreau, who will be there in her new tabard) in the Pageant. 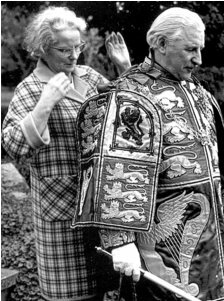 The article not only gives some background about "Tom," but includes a number of his comments about the tabard he wears, as well as the (older, made in Victorian times) tabards worn by the heralds in ordinary of the College of Arms. For example, I didn't know that if they get wet (as he notes they did once at a Garter ceremony at Windsor), they have to be dried out very slowly over the course of a year. He also notes that the tabards are "very valuable things — one isn't allowed to keep it in one's own house." 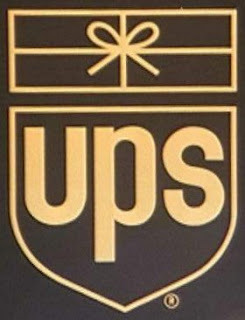 For the final installment of this “blast from the past” heraldry, we have two arms-like logos. 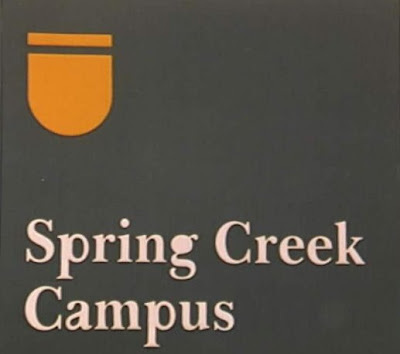 The first is the logo of the Assembly of God, a pentecostal and evangelical church. Not only is the shield metal on metal (argent charge on an or field, and an or chief on an or field), but it’s pretty much unblazonable. The AG is clearly the initials of the Assembly of God, and the chevron couped inverted is an open book, the Bible. 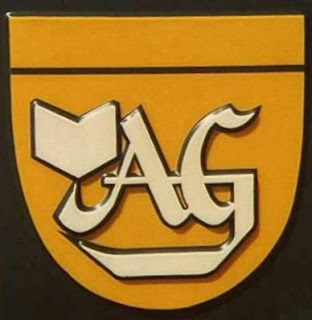 I keep trying to figure out what the thing underlining the A and G is supposed to represent, and have been unable to figure it out. I keep thinking that it ought to be obvious, and attempt to work in a shape with the crossbar of the A and G and the descender of the G, but without success so far. Since this photo was taken in 1998 the district has been rebranded, and is known now as Collin College, with the various campuses being a more integrated part of the organization. 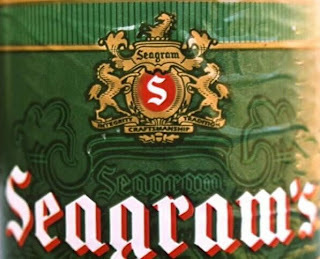 Today’s heraldic offerings from way back in 1998 are of a couple of companies which don’t seem to have lasted into 2012. The first is the logo of Windsor Management Company. 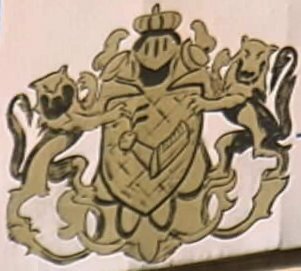 I suppose if I had to blazon it, it would be: Quarterly: 1st, Vert two bendlets sinister sable; 2nd, Murrey [it's not really gules] four fleurs-de-lis argent (I’m not at all sure how to blazon the arrangement; it’s very odd); 3rd, Murrey seven fleurs-de-lis 1, 2, 1, 2, and 1 argent; 4th, Sable two bendlets vert. 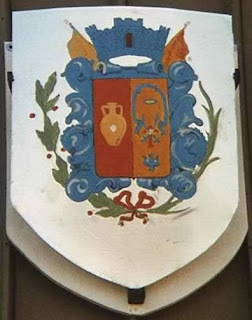 I have no idea if the white and black edging should be considered a bordure or merely artistic frou-frou (to use a “technical heraldic term”). 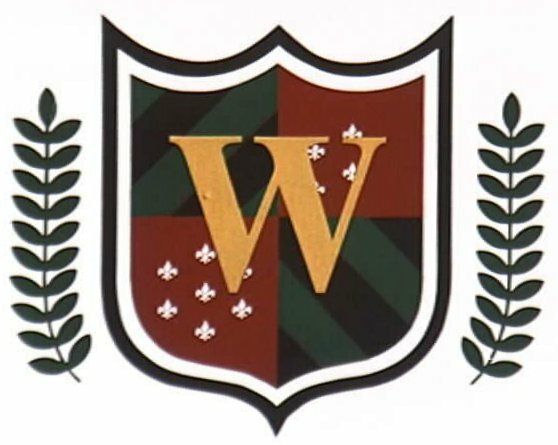 The other is an achievement of arms-like logo used by Ted Prohaska Auto Painting and Collision Works. The shield has a sinister arm in armor embowed; I’m not sure what the hand is supposed to be holding. The shield is supported by two wolf-like lions standing on a “gas bracket” style compartment. The helm, well, what can I say about the helm? It’s hard to tell if it’s a knight’s helm (affronty with the visor up) or a royal helm (affronty with a barred grill). It’s also difficult to tell if the thing on top of the helm is a cap of maintenance or a royal crown. Whichever it is, it's being improperly used here. Here’s a sign I ran across on a trip up into Oklahoma back in 1998. 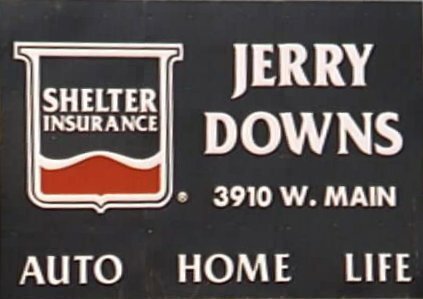 It’s from a billboard ad for Shelter Insurance agent Jerry Downs. The shield I suppose could be blazoned as: Azure the words Shelter Insurance, a base wavy gules fimbriated all within a bordurelet argent. In a post on the Facebook page for the Canadian Heraldic Authority earlier today, there’s a picture of the new tabard that the Royal Heraldry Society of Canada is donating to the Chief Herald. 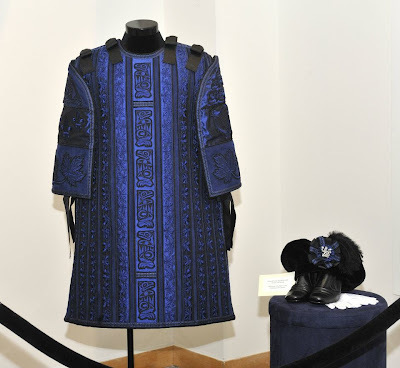 Entirely in royal blue, the tabard uses the colour emblematic of the governor general of Canada. ...The shield of the Royal Arms of Canada is embroidered on the tabard’s sleeves. The raven-bears on the central stripe are inspired by the supporters of the arms of the Canadian Heraldic Authority and honour the emblematic traditions of the First peoples. The stripes of alternating maple leaves, the quintessential national emblem of Canada, occupy the rest of the front and back of the tabard. The tabard will be worn with the collar of office of the Chief Herald of Canada, in addition to white gloves and a hat decorated with the viceregal lion, being the crest of the Royal Arms of Canada and the emblem of the Governor General. The tabard is a very nice piece of work, and not entirely traditional (generally, tabards have the arms on all four panels of the tabard: front, back, and both sleeves), but that is certainly in keeping with the way the CHA has adapted heraldic traditions for use in Canada and under the Canadian constitution. In a sudden spate of news articles, the London papers are going ga-ga over the work of some embroiderers, a 10' x 10' banner to decorate the royal barge, the Spirit of Chartwell, for the Queen’s Thames Diamond Jubilee Pageant next month. 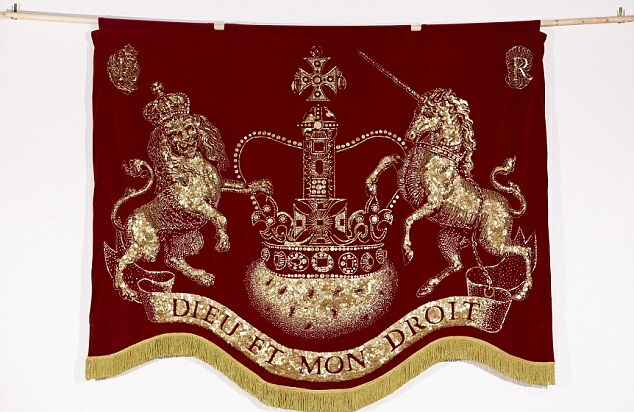 The banner, of red velvet with gold fringe, has a Royal crown between the supporters of the Royal Arms - a lion guardant and a unicorn - above the Royal motto Dieu Et Mon Droit, all created, in “an opulent nod to the East End's pearly kings and queens” with gold-colored buttons of various styles and sizes and hand-sewn on with gold thread. Having done beverage heraldry in the previous post, I thought I’d do some food heraldry in this one. Surprisingly enough, given how much turnover there is in restaurants in the area, La Tasca Española is still open for business today, so if you ever get a hankin’ (as we say down here) for some decent Tex-Mex cuisine, now you know where to find it. 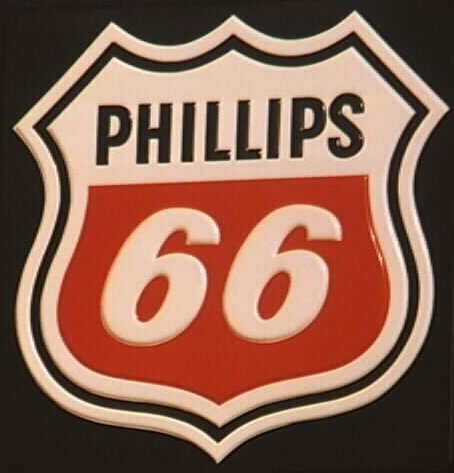 And to help you get there, here’s the logo of the Phillips 66 brand of gasoline. (Or petrol, for my British friends.) 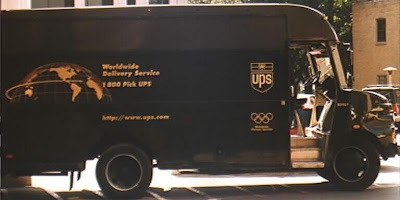 Gules the numbers 66 and on a chief argent the word Phillips sable. The Phillips Petroleum Company was founded in 1917 in Bartlesville, Oklahoma, and is now a part of the ConocoPhillips Company. 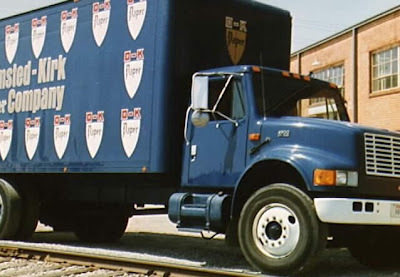 (Not unlike how Dallas-based Mobil Oil Corporation is now a part of ExxonMobil. If this keeps up, some day there will be only one gasoline company in the world, but it’ll have a really, really long name!) In 1927, the company was testing a new formulation of gasoline in a car on U.S. Highway 66. (Yes, the "Route 66" of song.) The car was doing 66 miles per hour (106 km/h). 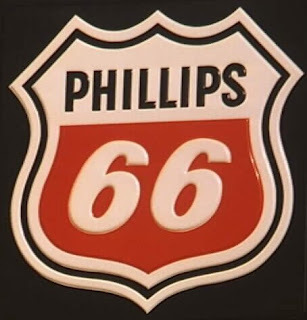 So they decided to name the new fuel Phillips 66 and placed the name on the same shield shape as those marking U.S. highways. And we’ve been stuck with that name ever since. I realize that many of you may have seen this already; it appears to be big news to some folks and I’ve seen it reported a number of places in the past two or three days. 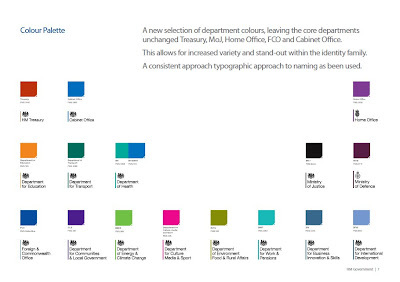 The idea for using a single logo for most government departments are part of the single domain project which came from Martha Lane Fox, the Government’s digital adviser, who also recommended last year that the Government develop a single online domain name, reducing the estimated 750 “top level” websites that government departments currently use to a single web address. 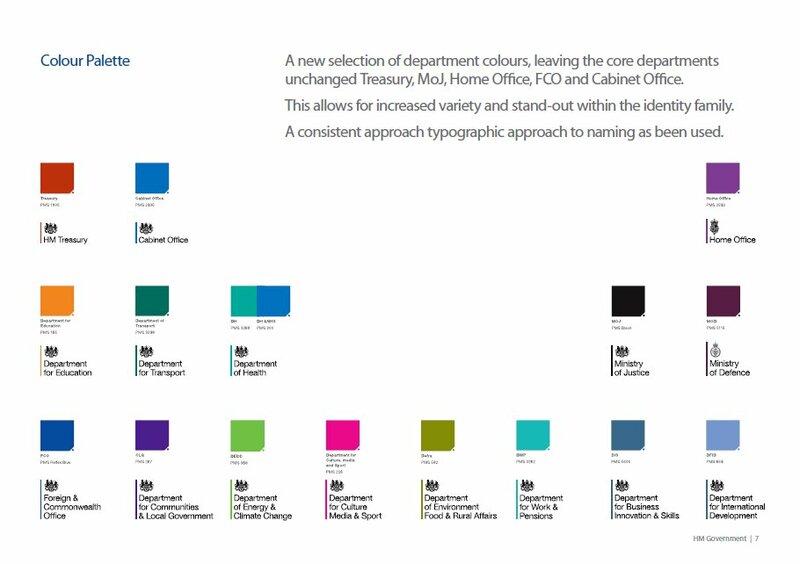 While I think that the whole scheme of using a single logo in different colors can be a worthwhile one, and has the potential to save the taxpayers of Great Britain some money at the same time (if everyone’s using the same logo, just in different colors, there is certainly the opportunity for some economy of scale there), I really do wish that they’d stop calling the Royal Arms “the royal crest.” But I suppose that’s a battle I may never win. 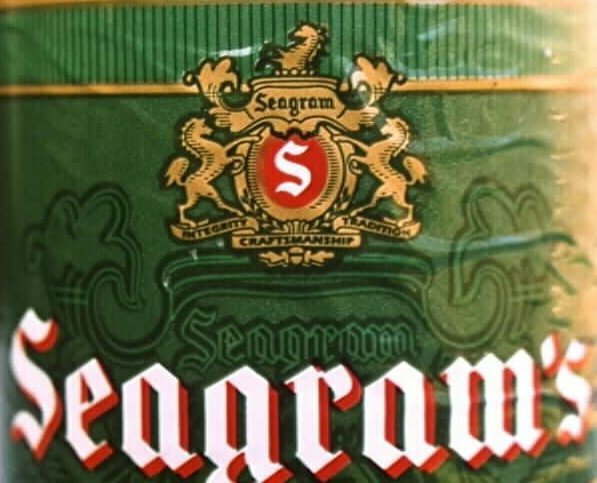 Today’s heraldic offerings from coats of arms or arms-like logos seen in and about Dallas, Texas back in 1998 are three companies which dealt in alcohol in one form or another. 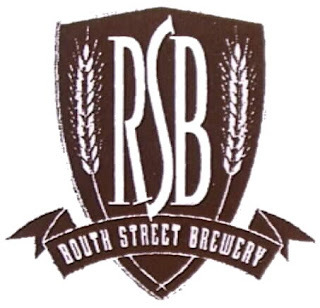 The first is the Routh Street Brewery, a micro-brewery located north of downtown Dallas. The design of the logo is nice and simple, though the purist in me thinks that not only is the scroll overlying the shield unnecessary, but that they didn’t even need to put their initials on the shield. 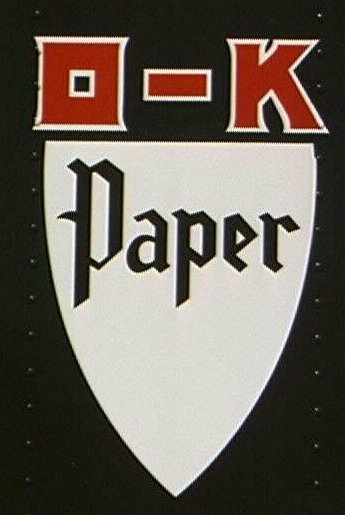 Still, given the lack of knowledge of heraldry of the folks who would be their target market, I can understand why they included those elements. 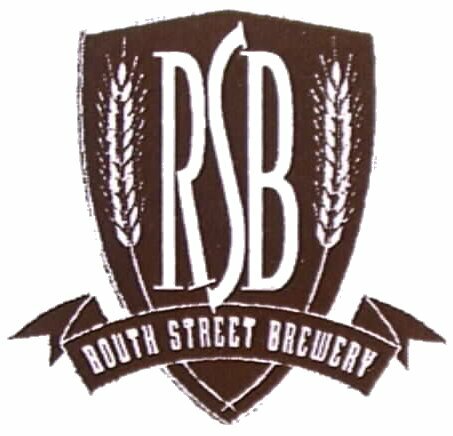 The brewery is, alas, no longer brewing, and even their website has been closed down. The next is a national brand, Falstaff beer, produced by the Falstaff Brewing Company of St.. Louis, Missouri. 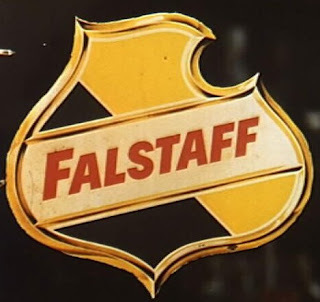 I saw this sign for Falstaff (Per bend or and sable, on a bend sinister argent the word Falstaff gules) in a bar somewhere on the east end of downtown Dallas. The company ceased production in 2005. 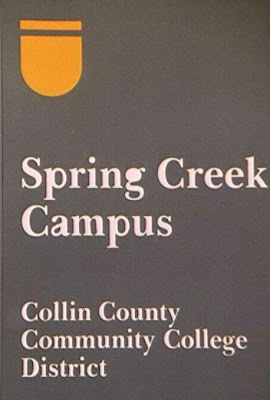 This next item is a photograph of a piece of memorabilia relating to a company that went out of business well before I was researching and photographing for my presentation in 1998. Braniff International was a Dallas-based airline from 1930-1982, with two successor companies using the name from 1983-1990 and 1991-1992. At one time it was a leader among airlines, painting its planes in bright colors and using fashion designers to design uniforms for its flight attendants, but it wasn’t able to survive the government’s deregulation of the airline industry. 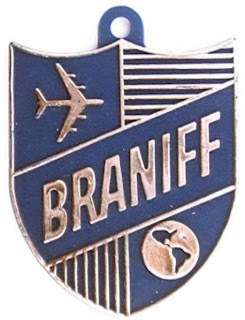 There are, of course, no tinctures marked on the piece, and I doubt that we can assume that the second quarter is hatched for azure (blue) and the third quarter for gules (red), but it makes for an interesting quasi-heraldic design with the jet airliner and globe in the first and fourth quarters. 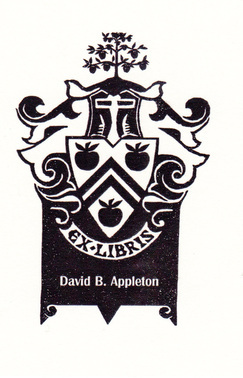 Peter Harling over at the Modern Armorial Bookplates website (the URL can be found below in this post and also in the left-hand column in Websites of Heraldic Interest section of this blog) has said some very nice things about some homemade bookplates I sent him. I will only say that I don't know how much I deserve his praise, since I have never considered myself an heraldic artist. 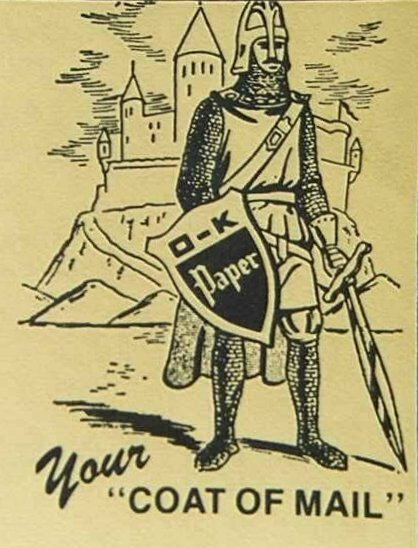 I do find it wonderful what can be done on a compter these days with some good heraldic clipart and a color laser printer. 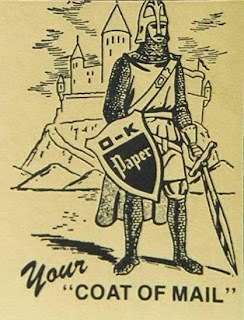 I appreciate his kind words, and recommend his website to anyone who is interested in heraldry, bookplates, or heraldic bookplates. Modern Armorial Bookplates can be found at http://armorialbookplatesmodern.weebly.com/ and the bookplates I sent him, along with submissions from other folks in recent weeks, can be found by clicking New Additions in the left-hand column there. This next heraldic logo from my collection of 1998 heraldic photos is one that I’ve always enjoyed simply for its combination of heraldry-like logo with a graphic representation of what the company does. 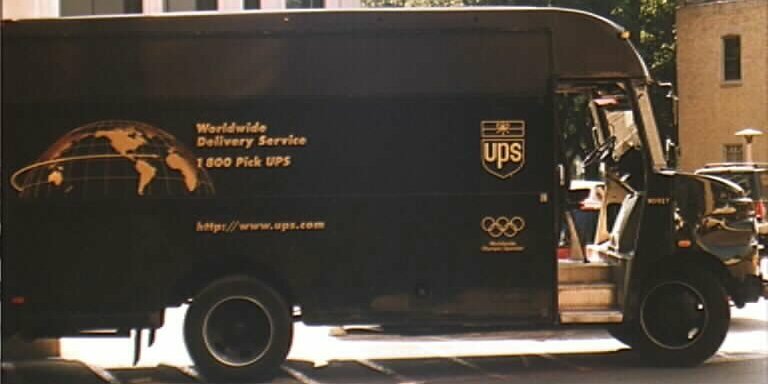 Although United Parcel Service has since gone to a more “modern” shield logo and have eliminated the tied parcel “chief,” there’s just something about this old one, prominently placed on all of their vehicles, that still attracts me.